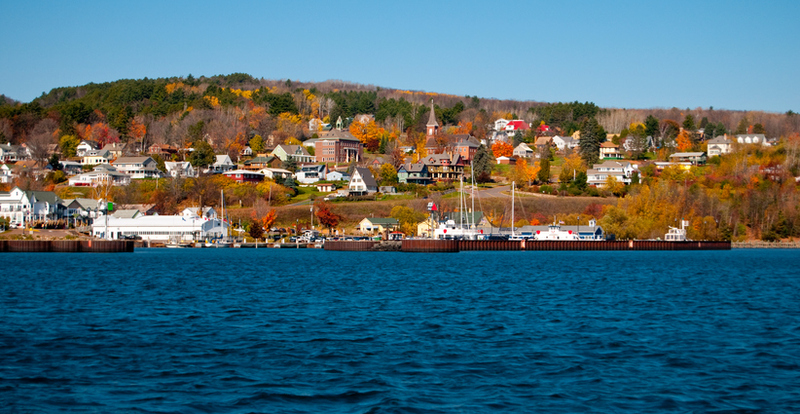 The quaint little town of Bayfield, Wisconsin on the shores of Lake Superior. Bayfield is surrounded by breathtaking natural beauty. Located on the southern shore of Lake Superior, it offers residents a wealth of recreational opportunities all year ‘round. Whether you live here permanently or you’re just stopping by, you must make sure to see the following attractions at least once. The Apostle Islands are a cluster of 22 wooded islands, only one of which – Madeline Island – is not part of the National Lakeshore. The National Lakeshore boasts the largest collection of lighthouses in the United States and includes 12 miles of wilderness in the mainland. The islands feature stunning sandstone cliffs and sea caves, as well as miles of beautiful beaches. The area is considered one of the best spots in the world for recreational boating. Kayaking on Lake Superior is a popular activity, as well as camping and hiking. In the winter, the sea caves turn into ice caves and are visited by hundreds of tourists. Bayfield’s unique microclimate is perfect for growing berries, and the city is known as the “berry capital of Wisconsin.” Bayfield’s Fruit Loop is a collection of around 15 farms and orchards along scenic County Road J. During berry season in the summer, visitors flock to these farms to pick their own strawberries, cherries, raspberries, blueberries, and blackberries. Autumn is apple harvest time in these orchards and you shouldn’t miss the annual Bayfield Apple Festival. The largest and only inhabited island among the Apostle Islands is home to La Pointe, a historic town where you’ll find charming shops, restaurants, a marina, and an 18-hole golf course designed by Robert Trent Jones, Sr. The island’s Big Bay State Park and Big Bay Town Park offer swimming beaches on Lake Superior, campgrounds, and hiking trails. La Pointe is also home to the Wisconsin Historical Museum. Located three miles to the south of Bayfield, this hill provides breathtaking views of Lake Superior’s Chequamegon Bay and the Apostle Islands. The area is a popular winter destination, with more than 65 acres suitable for alpine skiing, and more than 40 kilometers of skating and cross-country skiing trails. Other winter activities here include snowshoeing, dog walking, and skijoring. During the summer, the lush Mt. Ashwabay’s Trail System is frequented by hikers and bikers. The area also becomes home to the Lake Superior Big Top Chautauqua, an all-canvas tent theater presenting summer concerts, plays, lectures, and more. Explore three historic fishing towns – Cornucopia, Herbster, and Port Wing. These towns will take you to another time and place, with their natural beauty, historic buildings and structures, quaint shops, and art galleries. Cornucopia is Wisconsin’s northernmost town and is a gateway to the Apostles Island. Herbster is home to Bark Bay and the Bark Bay Slough State Natural Area, where you’ll find excellent fishing and boating. The town has a thriving art scene, with a visual arts exhibit happening every August. Port Wing also features three art galleries housed in historic buildings. There are more places and events to explore in Bayfield all year ‘round. If you’re looking for a home here or in neighboring Washburn and Ashland, call By the Bay Realty at 715-682-7337 or get in touch with us here.